Panasonic recently asked if we’d be interested in trying out one of their Arc3 electric shavers. When the Panasonic ES-SL41-S Wet/Dry Shaver arrived, I decided to test it out. I’ve never been a huge fan of electric shavers, as they usually end up irritating my skin. But in the name of science, I decided to be the guinea pig. What drew me to this particular shaver was the fact that you can use it wet or dry. I tried it in the shower with shaving cream, as well as in the bathroom completely dry, and both shaves were exceptional! My facial hair is pretty tough, and I didn’t think the shaver would be able to handle it. 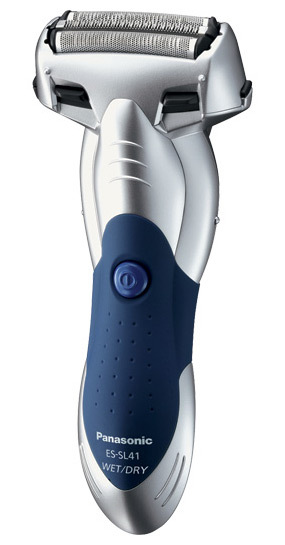 But the Panasonic gave me a fast, smooth, and close shave, thanks in part to their 30-degree angle nanotech blades. And the pop-up trimmer is great for grooming your sideburns or goatee. Another nice feature of this shaver is that it’s a breeze to clean after use, just switch open the water shutters and allow water to flow freely through the unit. No having to remove the outer foil like you do with other electric shavers. Panasonic quotes 21 minutes of use for every 15-hour full charge, and that’s pretty much what I saw. Overall, I was really impressed with this shaver, and I’d definitely recommend it if you’re in the market for a new shaver. Or if you’re fed up with the insane prices of razor refills! Panasonic ES-SL41-S wet/dry shaver is available nationwide in more than 2000 Walmart stores with a suggested retail price of $59.96.